Christian Bale plays Cheney as a cold and calculating opportunist. It is a film that documents Cheney's rise to power as vice president in an entertaining and sometimes darkly humorous way. The film is sometimes too light-hearted for the horrifying subject matter. Cheney starts as an intern at the White House. He becomes chief of staff and defence secretary to Republican presidents. In 2001 he becomes vice president to President George W Bush. In this role he exercises unprecedented power. Vice portrays George W Bush as a political lightweight who passes power to Cheney, who follows the incredible doctrine of the "unitary executive". This states that under the US constitution, the president's actions are always legal! Cheney extends his right-wing big business agenda over all major matters of US home and foreign policy. Prior to this Cheney becomes chief executive of Halliburton, a giant oil and gas corporation. On his election he becomes part of Bush's Energy Task Force, which includes big oil and gas interests. The film shows him having meetings with oil executives and dividing up Iraq for oil exploitation in preparation for occupation at some future date. While the 9/11 attacks on New York's World Trade Centre were an horrific event for many Americans, Cheney saw it as an opportunity. The film shows him prompting, pushing and distorting facts to promote the idea that Iraq had weapons of mass destruction and sponsored terrorism. He continued to press the lie that Saddam Hussein was linked to al-Qa'ida. His willing ally is defence secretary 'hawk' Donald Rumsfeld. This was the pretext for the invasion of Iraq in 2003. Cheney plays up the presence in Iraq of a small terrorist group led by al-Zarqawi to prove Iraq's guilt. The notoriety gained through this free publicity allowed al-Zarqawi to head Islamic State following the fall of Saddam. 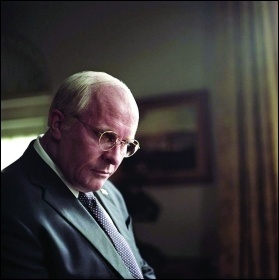 The film is effective in demonstrating the consequences of Cheney's decisions. When he and Rumsfeld make decisions in a light-hearted way, the film keeps shifting to graphic scenes of the blowing up of Afghan villages, the torturing of suspects, and Guantanamo Bay prison. I'm sure there is also some 'Hollywood history' in some of the dialogue. But it is still a graphic account of an authoritarian big business representative whose decisions are felt today in the Middle East and the world. 22 million emails went missing during the Bush-Cheney era and Cheney's office refused to pass information to people investigating the Enron energy company corruption scandal. So perhaps the real truth may never come out. The weakness of the film is that it does not show the wider opposition to Bush and Cheney's rule. The film concentrates only on the power politics in the White House. Nevertheless, it shows how little democracy there is in the 'Land of the Free'. 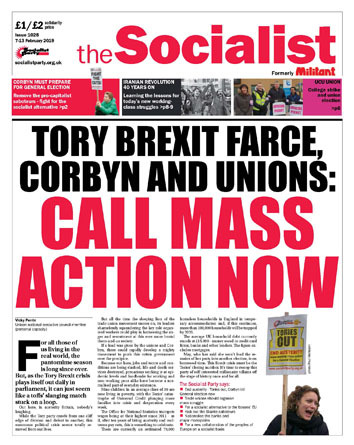 Only socialist change can guarantee that.